Capsule Summary: Frank is distraught and Hawkeye worried when the Army decides to replace as commander of the 4077th with a career officer named Sherman Potter. Watching this episode, I can’t help wondering what might have been. 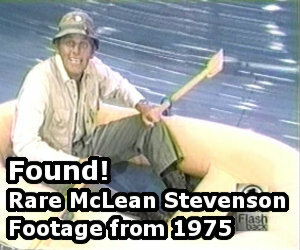 If you know your M*A*S*H history, you’ll know that McLean Stevenson and Wayne Rogers left the series after Season 3. The producers and writers knew that Stevenson wanted out and began to plan accordingly. Colonel Blake needed to be replaced. Things with Rogers weren’t so clear cut. Instead, Hawkeye and Trapper would likely reminisce about Henry together. Unlike B.J., Trapper would immediately know to worry about Sherman Potter the regular army man, the way Hawkeye did. And Trapper’s personnel file would be just as bad as Hawkeye’s. It’s possible, with Trapper involved, the episode would play out differently. But I doubt it. The bulk of the episode focuses on Colonel Potter and, to a lesser extent, on Frank. B.J. doesn’t have a large role and neither would Trapper. Frank would still fall apart in Margaret’s tent and later disappear. Colonel Potter would still order Klinger to put on a regulation uniform. Hawkeye would still worry about Potter in the O.R. “Change of Command” does what it needs to do: it introduces Colonel Potter. He may be regular army but he’s neither as strict nor as inexperienced in surgery as Hawkeye fears. Viewers learn he served in previous wars, loves horses, has a wife named Mildred, enjoys a drink or two, and can be flexible when it comes to Klinger. But why isn’t Potter concerned that one of his officers is nowhere to be found? Not only is Frank absent from the meeting in Potter’s office, he also doesn’t show up for surgery when wounded arrive. At the very least, Potter should wonder where one of his surgeons is. Drinking and singing in the Swamp. The scene in which Colonel Potter arrives at the 4077th was shown at the end of “Welcome to Korea” the week before this episode aired. It gave viewers a preview of the new commanding officer, enticing them to tune in next week and see what happens to the gang at the 4077th. According to the scene at the end of “Welcome to Korea,” Colonel Potter arrives at the 4077th on September 19th, 1952. “Change of Command” originally aired on CBS on September 19th, 1975. Colonel Potter asks Radar to straighten his picture of Lillie Bell. Instead, Radar manages to leave it crooked in the other direction. By the end of the episode, however, it’s entirely straight on the wall. Klinger’s story could have had its own episode. They should have left him out of this one and done that. Otherwise, I’ve always liked this one and I think it was the first one I ever saw. An excellent episode to introduce Col. Sherman T. Potter to the insane asylum that is the 4077th. At first, Frank took the news of being replaced as CO well, but once he entered Margaret’s tent, it was: Commence, temper tantrum. Frank: I already wrote Mommy. Margaret: I’m sure your mother will understand. Frank: I mean my wife. Margaret (clearly angry): BUZZ OFF!!! It’s moments like that that make me ambivalent towards Frank. I don’t know whether to laugh at his misfortune or feel sorry for him. The post-surgery sing-along in the Swamp with Potter, Hawkeye, and BJ really made this episode worth watching. I can still remember my first reaction to Potter taking over the 4077th, and in all honesty, I didn’t like him at first: Henry was a favorite of mine from those early seasons, I was still shocked over his death the previous season, not to mention blindsided by the departure of Trapper as well – it was too much change too soon, and I don’t adapt to change very well. Henry was a fun character – his imcompetence as commanding officer provided some humorous moments, such as whenever Margaret and Frank get bitchy about something and he’d rather not here it; he could also definitely be one of the boys, and palling around with Hawkeye and Trapper wasn’t beneath him. Then came Potter – by-the-book, regulary Army, straight-laced, and he just didn’t seem funny . . . I just didn’t like him. But, after time went on, and I got used to him, I realized he was just as wonderful a character as Henry: Potter wasn’t laugh-out-loud funny like Henry was, but he was humorous in his own way – his was just a dryer, more witty humor. Potter also proved to be flexible, as RJ says, and he too could show he could be one of the boys at times. But most of all, Potter became the show’s grandfather figure, which made him all the more endearing. After the time of getting used to him, I actually forgot about Henry (and Trapper) until I saw an earlier episode again afterwards and was like, oh yeah, I remember those guys. This episode, though not the first-aired, was the first-produced for Season 4, so Mike Farrell had to play BJ before he’d been introduced. “Welcome to Korea” was produced in 2 parts as the 4th & 6th-produced episodes of Season 4. To this day it still saddens me to think of Henry and Trapper leaving, and I always wonder how the show would have been had they stayed. Potter is a great character, while BJ I’m not a fan of, but neither of them come even remotely close to their counterparts. Henry and Trapper are and will always be my two favorite M*A*S*H characters, and the show was just never the same with them gone. Imagine Trapper being around when Frank finally left, and what the interactions between Charles and Henry could have been like. Like BDOR said, it was too much change too fast. I could have maybe been okay-ish with just one of them leaving, but both was like complete shell shock to me that I never recovered from. I almost hold a kind of resentment towards Potter and BJ because of it. I’m not sure about Trapper since the writers clearly didn’t put much effort into him, but I feel like had Henry stayed, he could have possibly grown into his position and eventually became a more competent commanding officer: Season 3 was actually showing signs of this, such as “Aid Station,” where he was unusually serious about the assignment of sending a surgeon, nurse, and corpsman to the aid station. Who knows? Margaret and Frank may have eventually earned a little respect for him as time went on. Trapper, I just don’t know. Personality-wise, he was almost too similiar to Hawkeye (understandable, they were originally intended to be interchangable leads), so their schtick of always tormenting Frank, always chasing nurses, always boozing their brains out, and always getting into trouble was kind of getting stale. With B.J. not only being a more rounded character, but being the voice of reason between the two, his and Hawkeye’s relationship was more see-saw and kept things interesting. Hmm yeah you may be right about Trapper, although with a good writer you can evolve any character. They could have moved him into a more serious counter for Hawkeye, although that would take away from the character itself. Henry for sure though could have stuck around and evolved like you said. Ugh making myself sad just thinking about it! Hah that episode with Trapper and the Chinese patient is exactly what I was thinking of when I was typing my response. Perfect example of the more serious side of Trapper, and that was way back at the beginning of season 2. Yes seeing him in Deluge could have been great, and imagine him giving responses in the Interview or the shenanigans we could have gotten with him and Margaret’s marriage! With Larry and Gene leaving though, who knows how the show would have turned out even if Trapper and Blake did stay though. The interaction between Trapper and Charles might have also been interesting, since Charles was a far superior surgeon and could hold his own against practical jokes. Or BJ being the voice of reason for Hawkeye and Trapper. But we’ll never know. How did Frank get injured? Was that ever explained? I would have loved to see Trapper play a practical joke on Charles. It might have been interesting to have BJ as the fourth member of the team, acting as the voice of reason. I would also liked to have seen a farewell scene between Henry and Radar when Radar went home. But in many ways Potter was a much better CO, knowing when to put his foot down but also recognizing the realities of wartime medicine. He came with the gravitas and experience needed to handle the insanity of the 4077th. Charles and Henry just wouldn’t have worked in my opinion. Charles was way too smart for a CO like Henry, and would have duped him into a transfer back to Tokyo within a few episodes. Charles needed Potter. You’ll notice whenever Charles is bitching and Potter takes it for a bit, then snaps an order at him, he instantly complies (like with the acupuncture, toothache, etc). PRESENT, SPOON! There is no way Henry could have handled Charles intellegence/rebellion. Hmm you do have a point there. Henry always was kind of a push over when it came to his doctors, even with Frank in a lot of ways. I could definitely see Charles marching in there and basically demanding to be transferred out, and Henry eventually just being like..fine. He even did do that for Frank in Fred C Dobbs episode. Probably just the huge Henry, Trapper, & Charles fanboy in me that would love to see the three of them interact, but you’re right, it probably wouldn’t have worked. A little off topic, but I would have loved to have seen Charles and Frank! Ooh the hilarity of that in an episode. Or three. I really liked this episode, and how it introduced Potter’s character and all his differences from Henry. I can understand how someone may have a hard time getting used to his character, and people who like MASH mainly for its comedy will probably always prefer Henry (though as BDOR said, I do like Potter’s very different, generally dryer humor), but I thought Potter’s introduction and breaking-in during this episode was handled well enough to be drawn to his character pretty much right away. The one main issue I have with it is the fact that Potter’s introduction scene was in “Welcome to Korea.” In that episode, it felt too forced and out-of-place, so it loses a lot of its comedic impact, as it does in this episode, since we’ve already seen it before. I can understand the reasoning for it, especially since this was a different time when all that mattered was the weekly airings, but I don’t think it holds up now, especially when you may watch the episodes back-to-back on DVD or in reruns (if the channel airs multiple episodes per day). That’s funny, Welcome to Korea just played on WGN, Saturday 8/19. I mean both WTK and Change of Command. What did Hawkeye mean when he said he’d fear Potter would have ’em bleeding by the numbers? Just assuming that a regular Army officer would automatically be a bad surgeon? This was a very good episode to introduce Col. Potter, although as I’m sure others have mentioned, I would have liked to see the camp under Frank’s command for a few episodes before Potter arrived. The whole Henry Blake Memorial Bar scene is touching and humorous. I like that Potter didn’t hold Radar’s “Stick that horn in your ear” comment against him. In fact, Potter seems to take a shine to Radar pretty quickly. How much time is supposed to have passed since BJ’s arrival at the camp? It almost seems as though the O.R. session is his first time. When Hawkeye asks him if he is ready, BJ says, “I hope so.” Also, Potter comes over and calms him down during a tricky operation. I know that part is supposed to establish that Potter is a more than competent doctor, but it just seems like BJ should have had some O.R. sessions before this one. Anyway, Hawkeye is thus convinced of Potter’s worth, and the drunken conversation and singalong in the Swamp is a classic moment which reveals that Potter is a normal, likable guy. It’s interesting to know that Mike Farrell had to jump right in and play BJ before the character was officially introduced. Several early 4th season episodes could have worked with Trapper instead of BJ. However, in this one, not many lines would have worked for Trapper, since the writers are trying to make it clear that BJ is new. I wonder if a script for this episode exists that was written before Wayne Rogers left. By the way, Hawkeye’s “bleeding by the numbers” comment means he fears that since Potter is a regular army man, he will make everything happen according to a strict procedure; in other words, he will turn the 4077th into a disciplined military camp. I wonder how the characters would have reacted if Potter had been a hard-a$$. Would they have ignored him and disrespected him the way they did Frank? I guess that was the whole point of making Potter flexible and likable. If the producers had wanted a hard-a$$ jerk, they could have stuck with Burns. Welcome to Korea (part 1) ends like a continuation to Change of Command. (part 2) So BJ never really set foot in the O.R. At least not at a army hospital. Both characters come in simultaneously on the show. What was Major Burns expecting Igor to say about the food arrangement in the mess hall? Frank wanted Igor to say “Yes, Sir, Major” but Igor instead replied “Yes, Sir, Yes, Sir, three bags full” which is a reference to the nursery rhyme “Baa Baa Black Sheep”. A lot of hidden gems in this episode., especially in the C.O. office. The whole Klinger-Potter meeting. “I play with dolls” and, of course “HORSE HOCKEY!!”. Hawkeye’s look when Margaret comes to attention and sticks her chest out. Potter’s “tsk, tsk, tsk” when he read’s Hawkeye’s file.